Don't over pack. Don't ever over pack. Especially when it comes to toys. Also, a week's worth of clothing is just fine -- you can do laundry along the way. Think packing for yourself is hard? Imagine traveling for two months straight with a messy one year old in temperatures that would range from 10 degrees (at the ski area we went to in Japan) to Singapore where it is currently 95 degrees and humid. 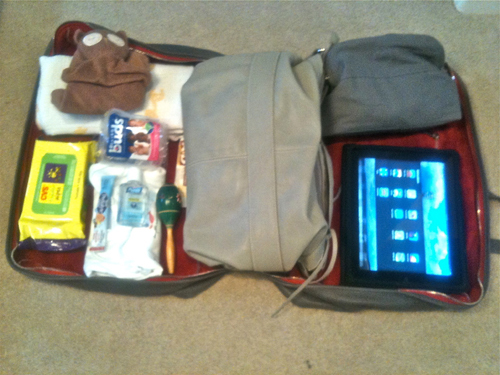 My goal was to pack as lightly as possible, to make sure I had all the essentials for Jacopo, and to still look stylish, rather than like a mom carrying most of her kid's room in tow. The thing that helped me best in my packing approach was a "bag within a bag within a bag" philosophy. 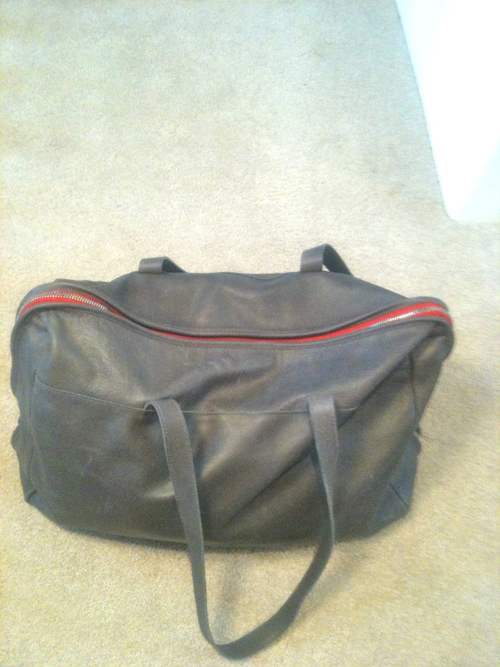 I bought a gorgeous leather bag (the 36 ore model) from Officine 904, a new cult shop in Pienza, Tuscany for this trip. It was designed as a long weekend tote or computer/work bag and it unzips completely. I wanted to use it as my shoulder bag for the plane. Inside it I put a smaller handbag with my phones, wallet, travel documents case (Comme de Garcons' are genius) and other essentials, plus my make-up bag. In the space left over I could still fit a change of clothes for the baby and a top for me, a couple of extra diapers, wipes, purell, a small tube of A+D, a light cashmere travel blanket from Calypso, a couple of baby books, a ziploc bag of toys and some snacks for Jacopo (I found a great multi compartment baby lunch box at Tokyo's Mono shop in Narita, complete with a spoon, fork and chopsticks from a firm called mono comme ca, its design is super funky). 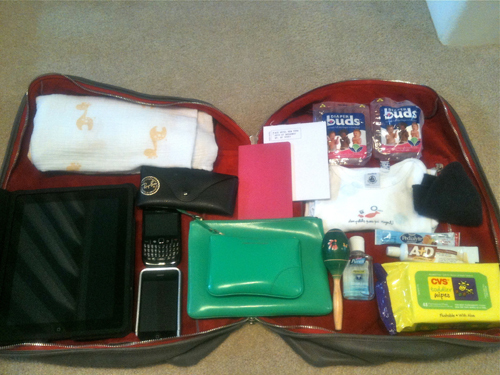 The smaller handbag served as an inside compartment within the bigger bag. Meanwhile my husband's Flight 001 shoulder bag held the diaper bag with more baby clothes and diapers in case the checked bags went astray (skip hop makes great ones) plus his travel documents, essential medication for the family and a small travel pillow. Then a small rolling bag (my favorite is from Mandarin Duck) carried our computers, magazines and a couple of travel books (although we now have most of guide books on an iPad and mags on Zinio.com), all the things that you don't want to have weighing you down. A great travel find for this trip was a new product called diaper buds. These tiny vacuum-packed diapers are ideal for traveling and to stick in your pocket. They barely take up any space. We needed to plan ahead because of the weather variations and since I knew that most of the trip would be in warm weather places I shipped our coats, boots and heavier sweaters to my mother in law in Hawaii, the last stop before Japan -- the coldest destination on the trip. Due to a mailroom snafu (you, dear intern, shall remain nameless) my perfectly laid plan was foiled and the coats didn't make it, but luckily we found a discount outlet for winter coats in Hawaii (who would have guessed?). I would still recommend trying to ship when you can. Don't over pack. Don't ever over pack. Especially when it comes to toys. Most of the family-oriented hotels have toys on-site anyway and Jacopo mostly wants to play with pebbles, sand, plastic cups, buckets and brooms anyway. At a young age kids are entertained by pretty much anything. We had one ziploc bag with things like a little Mexican rattle, a small plastic airplane, a couple of books, and a couple of finger puppets. Along with a few toddler-oriented apps on the iPhone (like my favorite Old MacDonald by Duck Duck Moose duckduckmoosedesign.com/educational-iphone-itouch-apps-for-kids/old-macdonald) we didn't need anything else. And in Asia there were tons of play areas and toys in the airports, such a great amenity. The over-packing thing goes for clothes too. A week's worth of everything is just fine -- you can do laundry along the way. And shoes are a killer to pack so choose wisely. If you need to bring heels (I did) pick ones that go with everything. I also love sandals from French company K. Jacques; they are so light and nice for the beach and going out. I usually fly in Converses or Repettos. My husband and I also travel with one piece of checked luggage each and we put the baby's clothes in the huge outer pockets of our checked Mandarina Duck piece. I know I am a bit of an exception on this but I always like to check in my stroller with my bags. I wear Jacopo in a Baby Bjorn because I can't stand carting the stroller through security. We also opted not to bring a car seat after making sure beforehand that we would be able to get one in every place we traveled.